“The Sweet Spot” in sports relates to the spot on a racket, bat, or club where if hit it will have the maximum effect. I first discovered it playing tennis, and I first recognized it as a sound, an indefinable, unique sound. I heard the sound when the ball hit the racket at just the right spot and angle, resulting in the ball going with great force and speed right where I had intended it to go. When you hit “The Sweet Spot” you can feel it and often see it. It just feels right. In education and child development, when we hit “The Sweet Spot” it produces a very sweet sound as well, the sound of success. 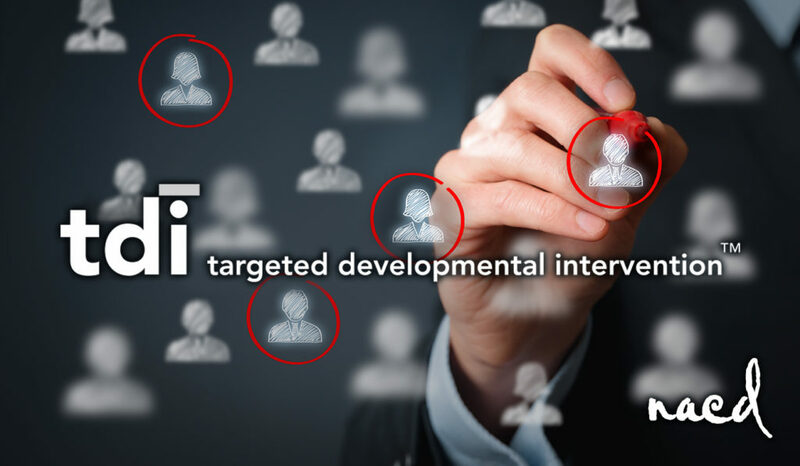 I coined the term “Targeted Developmental Intervention” largely with “The Sweet Spot” in mind, with “targeted” referring to hitting the sweet spot. Efficient, effective educational or developmental intervention is predicated on coming as close to the child’s sweet spot as possible and staying there. The further we come from hitting the bull’s-eye, the more off target we are and the less effective the intervention. Educationally “The Sweet Spot” is the spot just a tad above the child’s present level of knowledge or ability, not too far above it or below it. The further we are from “The Sweet Spot,” the less effective the instruction or intervention. Miss the bull’s-eye by too much and the child is either bored or lost and defeated. And they learn that they either dislike the boring subject or that they don’t understand it and perhaps feel like a failure as well. For many years I have taught that in any specific learning session, first teach the child to love whatever you are trying to teach. Let’s have fun, let’s generate positive intensity, and let’s turn you onto learning. The closer you come to “The Sweet Spot,” the more realistic this goal becomes. Decades ago I made the statement that preschool age children loved learning anything, and that we then send them to school where they spend twelve years learning to hate learning everything. Sadly this statement is not too far from true for many children. Most subjects are built incrementally, and each new step is built upon the foundation of the previous steps. Missing steps weakens the foundation and does not result in good outcomes. Mathematics is one of the easiest examples for most people to understand “The Sweet Spot,” but all learning is dependent upon steps, building upon a foundation. When we at NACD direct a home-based educational program, we have the luxury of being able to periodically assess a child and find out exactly where they are and then target their next step. In so doing we are targeting “The Sweet Spot,” learning occurs very rapidly, the child advances very quickly, and they get excited about their learning and advancement. To put it in perspective, most of our typical NACD children, and even most of those who have some learning challenges, can often advance two or more grade levels in math per year if they devote 15-20 minutes per day to the subject. That’s typically a fraction of the time that most children going to school have to spend on their math homework each day, let alone all of the classroom time. Contrast an individualized program targeted to the child’s sweet spot with a typical classroom. If there are ten children in a class, there are ten children at ten different levels. If there are thirty, there are thirty different levels and sweet spots. Some classrooms may separate the students into a couple of different groups based on level or “ability,” but in a typical sixth grade classroom you could have children’s skills and knowledge levels of a subject spanning four years or more. In a seventh grade math class, they teach seventh grade math to all of the students using the same book/curriculum. (Let’s not even get into the entire issue of the Common Core math that even parents with PhDs can’t figure out well enough to help their kids with their homework.) The same curriculum is used for everyone, whether or not Johnny ever learned his math facts or how to do fractions and decimals, or if Susie sitting next him learned addition and subtraction when she was four and already has algebra nailed. Where’s “The Sweet Spot?” Where’s the target? Effective, efficient education demands targeted instruction. For the vast majority of kids who attend school, that is really only to come from good online programs. Teachers in a classroom can’t identity, let alone teach, to thirty different sweet spots. Another huge aspect of teaching to “The Sweet Spot” involves processing abilities. It is crucial that we understand individual students’ ability to process information, and while directing input to where they are now (targeting), that we also provide the necessary opportunities and input to build the cognitive foundation of learning. Having graduated from high school and perhaps college or even receiving advanced degrees, I would wonder how many of you ever found out if you had good auditory or visual processing function or a strong ability to visualize (think in pictures) or conceptualize (think in words)? How tragic is it that virtually no one going through school in this day and age never finds out if they have basic learning inefficiencies, and that they are never given the chance to address them and improve them? Taken one step further, virtually everyone has the innate potential to develop super foundational and cognitive skills if given the opportunity. How can you teach to the child’s sweet spot without knowledge of their inefficiencies and without targeting their learning strengths? As critical as hitting “The Sweet Spot” is for education, it is even more important for overall development; and the greater the child’s developmental needs, the more critical it becomes. In my decades of work with children with the full range of developmental needs, I have been very distressed by the commercialization and lack of real change for those with special needs and learning and attention-related issues. You can find everything from the many centers where you can take your child who has learning and attention problem that ultimately offer a one size fits all program (which are usually based on some of our concepts from over fifty years ago), to the programs that offer one specific thing, which is miraculously going to fix everything. Then there are the therapeutic interventions that haven’t significantly changed in fifty years, which are still using a delivery model that is based on economics, not optimization, despite the poor outcomes. Therapeutic intervention that occurs once or twice a week is a long way from optimal. Neuroplasticity, the foundation of all growth and development, is triggered when we supply the brain with very specific, very targeted input delivered with the necessary frequency, intensity, and duration. Without a doubt our best outcomes are produced when we have very proactive, communicative parents who supply us with a lot of ongoing information so that we can constantly modify programs to stay on “The Sweet Spot.” The crowd-sourced Open Dictionary defines sweet spot as “the best possible place or combinations of factors.” Isn’t that where you want all of your children, and particularly those with developmental issues, to be? Based on our years of experience, as well as having worked with literally tens of thousands of children with issues and needs covering the spectrum, we spend every day developing and utilizing thousands of tools, always looking for a new tool, a better way. I would think it highly unlikely that if one were to go through all of our charts they would ever find the same program written for two different children. Why? Because no two children are alike.